The body of a murdered and mutilated child prostitute is found on a bridge in New York in 1896. 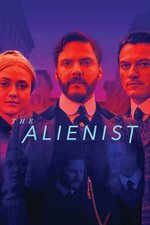 Alienist Dr. Laszlo Kreizler, who has been asked to consult on the case by Police Commissioner Theodore Roosevelt, enlists the help of his Harvard classmate, New York Times illustrator John Moore, and then that of Commissioner Roosevelt's secretary, Sara Howard, who is also a lifelong friend of Moore's. Together with two brothers, Detective Sergeant Marcus Isaacson, Detective Sergeant Lucius Isaacson, they form a de facto special unit to investigate the murder, which Dr. Kreizler believes to be connected to the murder of two of his former child patients. The first two episodes don't sell the show. I fell asleep midway through. By the third episode it picked up and kept my attention. Luke Evans and Dakota Fanning were excellent. I'm assuming this is a show only thread? I found this show's strongest point was its visuals. It feels like quite an authentic view of what New York was like in 1896, because we see both the rarefied elegance and the underlying misery of the Gilded Age. The costuming is wonderful -- Dakota Fanning's costumes are particularly fabulous -- and it's an especial treat for me to see Luke Evans in his beautifully tailored suits and waistcoats. I like that this show takes unexpected turns, that you think John Moore is going to be the romantic hero of the piece, but it turns out that he takes a back seat to Dr. Kreizler, and then it turns out that Dr. Kreizler, for all his intelligence and brilliant insights, has his own major blind spots. Having read the book, I think they absolutely nailed the sinister feeling of Gilded Age New York. I like the characterizations for the most part, although I wasn't expecting to see TR in episode 1. The set design is brilliant, all the vast rooms, and I didn't even recognize Dakota Fanning as first, but she's killing it. Can't wait to watch ep2. I like the feel of the show, the set and costume design. it's been a long long time since i've read the book. I am having a hard time with the characterization of TR, but that is probably my own prejudice as a student of his life and works. In this story he is a set piece, not an historical character. In regards to the set, I know I'm old because half the time I'm like, "Man I feel sorry for anyone who has to dust in that place." It may be because Alias Grace is still fresh in my mind so I tend to immediately think about how much work would need to go into keeping a place like that. Just read the novel last week. I found the book much better written than the show's script. So many of the show's maddening flaws weren't at all present in the book. In the show Laszlo gets side-tracked into an obsession with understanding the killer and alienates (see what I did there) his team by trying to analyze their personal issues while refusing to examine his own. In the show he never loses sight of his main purpose, which is to find the killer before more lives are lost (though he is hoping to gain valuable psychological insights from examining the killer once he is found and safely locked up), and he always behaves very professionally towards his team, largely because as such a cerebral man maintaining a certain critical distance from everyone and every situation is simply what he does. While he has indeed undergone traumatic abuse in his own childhood and it is probably what drives him to help children, he's evidently dealt with his past in his own way and is a quite functional and very brilliant man. John Moore's character also suffered at the hands of the script writer. In the show he's an illustrator for the New York Times, which makes for a tenuous connection to the case (i.e., Laszlo has him make some drawings of a murder victim, which he then declares to be of no use, and John just stays with the case because he lacks purpose in life or something), and he's a lazy wastrel who's so hung up on his broken engagement that he's into some seriously sad role play with prostitutes. In the book John is a reporter for the New York Times whose extensive knowledge of the city and many connections make him a very valuable member of the team. He is also an excellent strategic thinker and quick-thinking and resourceful in a crisis. In the show John gives Joseph money and tells him he doesn't want him working the street; in the book John teaches Joseph to play pool with the idea that he'll be better off as a pool shark than as a child prostitute. See what I mean? The second effort to help Joseph bears evidence of a much more practical and far-seeing mind than the first does. His former fianceé is mentioned just once, in passing, and seems to be a non-issue. He's a cultured man who loves the opera (in the book he hates it and falls asleep when dragged to a performance by Laszlo). While he does drink, gamble, and resort to prostitutes, and is disaffected with high society because he knows too much about its underbelly, it doesn't appear to be interfering with his work or his relationships with others, though it does seem to have made him something of a black sheep among his parents' friends. Sara's character didn't fare so badly in her transition from page to screen -- she's the most functional character in the show and has been developed more than she was in the book, at least. But I don't know why the script writer thought it was a good idea to load everyone down with personal issues. In the book everyone is quite functional and gets on with the job of finding the killer to the best of their considerable abilities and it's a pleasure to watch them work and follow the course of the investigation, but the script writer seems to have believed that we all needed to see a lot of manufactured personal drama and conflict, which bogged down the script and made the characters look like idiots.... and then told us too much about the killer too soon, which largely destroyed the real suspense of the hunt to the point that the last few episodes felt like an anti-climax. Arghh, such hack writing. There is a sequel to The Alienist, which I believe I will read in advance of the second season of the TV show, which is apparently in pre-production as of this writing, so as not to have the suspense of the book spoiled for me by the show.